I Wish I Had Waited On God! Have you noticed a reoccurring pattern in Abraham and Sarah’s life? Every time they gain spiritual ground or receive a revelation, testing or trials immediately follow to evaluate God’s word. How many of us have had to learn the hard way…there are no shortcuts in obtaining God’s blessings. Shortcuts are any paths that miss God’s perfect will for our lives. Simply put, a shortcut is an alternative route that is shorter or quicker than the one prescribed by the Lord. 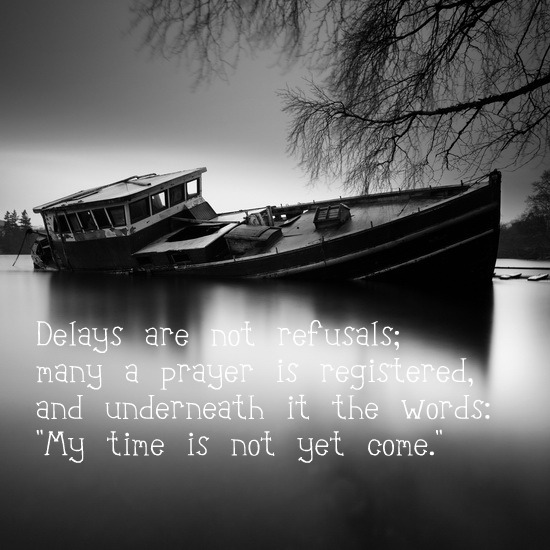 We usually find at a later date that we also didn’t exactly arrive at the Lord’s destination. Just because everyone else says, “it is ok” to choose the alternative route, doesn’t necessarily mean it is God’s will. Everyone approved of Abraham and Sarah’s “shortcut” to obtaining the Promise of God. Society Approved. This arrangement was common and encouraged among the people of Abraham and Sarah’s day. If Abraham was given Hagar as a wife and had a child by her, society would not criticize, despise, or reject the results. Instead, they would have applauded. What society of their time did frown upon was not having an heir. Sarah Approved. Sarah plainly accepted the norms of society. This shortcut must have her unqualified seal of approval, or neither party would hardly consider such a plan. With Sarah making the proposition of the shortcut to God’s perfect will, it was clear she approved of the plan. God Rejected. Abraham approved, Sarah approved, and society approved, what more could anyone ask? They all could have and should have asked for God’s approval! There is one thing worse than waiting on God, IT IS WISHING YOU HAD WAITED ON GOD. In the next few blogs I will spend some time on how Abraham and Sarah missed God’s will. They didn’t ultimately miss God’s will entirely. They simply took a side road or shortcut God never intended them to travel. Like most of us know, these are easy roads to travel. Follow the blog and see if you agree.